A nut is a type of fastener with a threaded hole. Nuts are usually used opposite of a bolt to fasten parts together. The nut and bolt are held together by their threads' friction, a slight stretch of the bolt, and compression of the parts. In instances where rotation or vibration work a nut loose, different locking mechanisms may be used like adhesives, lockwire, and washers. Nuts are widely used in machine assembly and for assembling parts in industrial, construction, and military applications. Value Fastener offers high-quality nuts and other hardware at competitive prices. Our nuts are available in both imperial and metric sizes and come in all styles, materials, and finishes. Request a quote today or contact us to discuss our hardware nut options. Value Fastener stocks a large inventory of hardware nuts in imperial and metric sizes to meet a range of application requirements. Material options vary depending on the type of nuts selected and include 18-8 stainless steel, Grade 5 steel, low carbon steel, and zinc coated finishes. 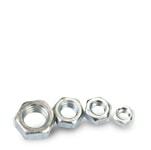 Browse our selection of screw nuts and self-clinching nuts and request a quote for the size and style you need. Contact us if you have any questions regarding our available products. Cage Nuts: Feature wings that assist wit bolt insertion and are used to mount server racks and other equipment. Imperial sizes range from 6-32 to 1/2-13 and metric sizes include M5 and M6. Cap Nuts: Have a domed cap to cover exposed threaded studs, rods, and bold ends. Available in closed end and open-end cap nut options, including washer-based nuts, in imperial sizes from 1-8 to 7/8-9. Castle Nuts: Slotted nuts with notches cut into one end. Available imperial sizes from 1-8 to 1 1/4-7. Conduit Lock Nuts, Die Cast Zinc: Prevent fittings from being loosed by motion and vibration and are widely used in electronic assemblies. Available in imperial sizes from 1/2 to 1 1/2 and made from zinc to provide strength and anti-sparking properties. Coupling Nuts: Internally threaded fasteners used to join rods, pipes and other threaded parts. Includes standard and reducer couplings in sizes from 1-8 to 7/8-9. Flange Nuts: Feature a wide flange at one end to distribute the pressure of the nut over the part being secured. Offered in serrated and non-serrated options in imperial sizes from 1-8 to 7/8-9 and metric sizes from M3-0.5 to M20-2.50. Flex Type Lock Nuts: One-piece, hex-shaped nuts that expand to create a torque locking action when a screw or bolt reaches the collar. Available in imperial sizes from 1-8 to 1 1/4-7 and an option of heavy hex or light hex with full or thin height. K-Lock Nuts: Designed with an attached, free-spinning serrated washer that creates tension against a material when installing into a bolt. Available in conical and regular or small pattern styles. Sizes range from 4-40 to 1/2-13. Machine Screw Nuts: Includes hex and square-shaped nuts designed for use with machine screws. Select from imperial sizes ranging from 0-80 to 3/8-24. Metric Nuts: We offer several types of nuts in metric sizes including self-clinching nuts, cage nuts, lock nuts, hex nuts, tab weld nuts, and much more. Mil-Spec Nuts: Options for Mil-Spec nuts include MS35649, MS35650, MS51967B and MS51967C hex nuts. Nylon Lock Nuts: Hex nuts with a nylon-fill collar that forms a tight, frictional fit. Options include flange, heavy hex, light hex, and metric options. Imperial sizes range from 1-8 to 2 1/4-4.5 and metric sizes range from M2.5-0.45 to M24-3.0. Panel Nuts (Pipe): Hex panel nuts are thin with a large hole and commonly used in lightweight fastening applications. Size options include 1/8-27, 3/8-32, and 15/32-32. Reversible Hex Lock Nuts, 2-Way: This style of hex nut features two round or rectangular indentations on the outside flats of the nut and can be used top-up or top-down. Available in sizes from 1-8 to 12-24. Self Clinching Nuts: Also known as swage nuts and are used to fasten sheet metal and other soft materials. Offered in several imperial and metric sizes. Slotted Hex Nuts: Feature slots cut into the non-bearing portion of the nuts and are used for general fastening or with a cotter pin to prevent loosening. Offered in imperial sizes from 1-8 to 1 1/2-12. Square Nuts: Square-shaped with a large surface area that resists tightening and loosening. These screw nuts are used in applications ranging from furniture assembly to railroads. Available in imperial sizes from 1-8 to 1 1/2-6. Steel Spring Nuts: The low-profile design of spring nuts is ideal for spaces with minimal clearance. They double as a washer and nut and are easy to install and remove. Available styles include flat, type “J” and type “U” in a wide range of standard sizes. Stover®-Equivalent Lock Nuts: Hex-shaped lock nuts in options including Grade B-Lock, Grade C-Lock Automation Style or Hex Collar Style, and Grade G Flange Lock. Available in standard imperial sizes. Tee Nuts: Provide an internally threaded surface for fasteners and feature a head style that digs into the material surface. Offered in 3-prong, 4-prong, and 6-prong styles in imperial sizes from 4-40 to 3/8-16. Weld Nuts: A special type of hardware nut designed to be welded to another object. We offer hex, round base, spot weld, square, and tabbed options in various styles and imperial or metric sizes. Wheel Nut, Right Hand: Automotive screw nuts with a right-handed thread. Offered in imperial sizes from 7/16-20 to 1/2-20. Wing Nuts: Install by hand and are commonly used with parts that need frequent assembling and disassembling. Available in cold-forged, stamped and washer-based options in imperial sizes from 4-40 to 3/4-10. Our inventory includes a variety of standard and self-clinching nuts for securing bolts in a range of applications. Request a quote for the hardware bolts that meet your requirements or contact us with questions regarding our inventory.